In some ways, Rudy Giuliani has done exactly what President Trump hired him to do as his attorney: publicly defend him while discrediting Special Counsel Robert Mueller. Giuliani has stalled on whether the president will sit for an interview with Mueller, attempted to move the goalposts by emphasizing that “collusion is not a crime,” and even employed dramatic facial expressions to suggest that it’s Mueller’s team, not the White House, that’s being kooky and unreasonable. But of course, there’s a flip side to Giuliani’s attention-grabbing performances. Shortly after his hiring he was on Hannity revealing that Trump knew about the Stormy Daniels payment, despite his denials, and since then he’s continually found new ways to stick his foot in his mouth. Last week, Vanity Fair’s Gabriel Sherman reported that after a particularly gaffe-filled spate of media appearances, even Trump was losing his patience. “Trump thinks he’s saying too much,” said a Republican close to the White House. But Giuliani has yet to be sidelined, and he’s continued to demonstrate that much like his boss, he’s incapable of reeling it in. 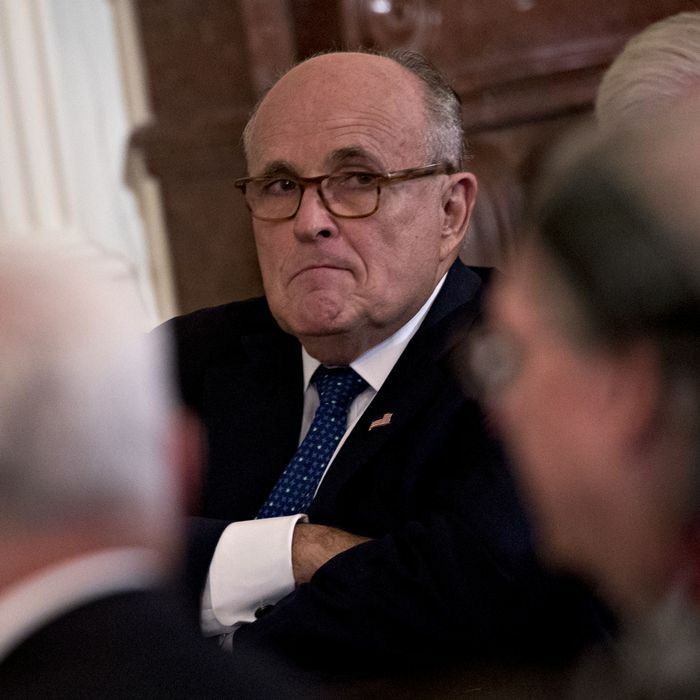 On Monday night, Giuliani continued teasing the possibility of Trump talking with Mueller while attempting to severely limit the scope of their discussion. Giuliani told the Washington Post that Trump’s legal team is about to send a letter to Mueller rejecting his offer of an interview that includes limited questions about obstruction of justice — which appears to be the primary topic the special counsel wants to address with Trump. “We have a real reluctance about allowing any questions about obstruction,” Giuliani said. He acknowledged this could annoy federal investigators while offering a contradictory explanation for why he can’t talk to Mueller, though supposedly, he’d like to. So Trump’s attorneys are both worried about Trump perjuring himself, and so confident that his private statements would match his public comments that an interview is unnecessary. After a long day of working to thwart Mueller, Giuliani tried to unwind by tweeting attacks on Rahm Emanuel, misspelling the Chicago mayor’s last name and falsely claiming that 63 people were murdered when in reality 11 people were fatally shot over the weekend. 63 murders this weekend in Rahm Emmanuel’s Chicago. His legacy more murders in his city than ever before. It’s only because of Democrat brain washing that he has even a chance of remaining. Support police professional Garry McCarthy. Then he raged at a random Fox guest who suggested he’s a smoker. There is a moron on Fox claiming I chain smoke cigarettes worrying about the President’s tweets. Don’t smoke cigarettes. Hate ‘me. Smoke only premium cigars and I hope this idiot is not a lawyer because if he is he should sue his Law School. "Don't smoke cigarettes. Hate me." Literally the best advice Rudy has given anyone in a very, very long time.